The wait is almost over! The Power Rangers Dino Supercharge Mid-Season Premiere is this coming Saturday on Nickelodeon! Enjoy three episode stills sent to us from Saban Brands as we await for a trailer that we can share on our front page with you! Episode 09, Besties 4Eva, airs this weekend. And be sure to check your local listings for the time in your area on Saturday, August 20th. Click the title of the story to see all the Power Rangers Dino Supercharge Mid-Season Premiere Episode Stills! The next DVD for Power Rangers Dino Charge from Lionsgate has been announced! In Power Rangers Dino Charge: Rise, fans will be collecting the episodes “Sync or Swim”, “True Black”, “Rise of a Ranger”, and “No Matter How You Slice It”. The DVD is scheduled to release on September 27th for $14.98. Check out the full press release below!! Saban’s Powers Rangers embark on all-new adventures in Power Rangers Dino Charge: Rise, arriving on DVD (plus Digital HD) September 27 from Lionsgate. In the spooktacular Halloween edition, the Power Rangers must overcome their differences and work together to defend the Earth from evil using their dino-charged powers. 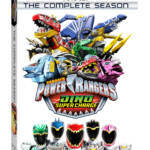 Top-rated in its time period with kids 2-11, Power Rangers Dino Charge: Rise will surely keep its devoted fan base on the edge of their seats when it arrives on DVD for the suggested retail price of $14.98. The Power Rangers rise and take action-adventure to the next level as Tyler and Ivan put their differences aside to defuse a bomb; Chase races to free his friends from an underground tomb; Prince Phillip learns that he can’t buy his way into the Power Rangers; and Riley and Koda restore the team’s broken bonds of friendship in these dynamic, thrill-filled adventures. Will you be picking up the new DVD? Join in our discussion thread! 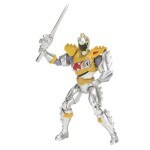 What a great item to add to your Power Rangers Dino Charge collection! A lot of these items we’ve already seen before but we have better looks now. Enjoy these images of Power Rangers Dino Supercharge! We did some digging on WalMart.com and found images for all 10 of the Power Rangers Dino Supercharge heroes and their “Dino Super Drive” mode! This mode has been featured in trailers for the brand new season. What do you think? Are these the ultimate versions of your favorite heroes? Sound off in our discussion thread on all this Power Rangers Dino Supercharge toy news!